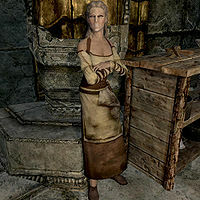 Frabbi is a Nord food vendor who works in the Silver-Blood Inn in the city of Markarth. Her husband is Kleppr and they have a daughter, Hroki, and a son, Hreinn. She has an acerbic relationship with her husband, though she will dislike you if you kill him. She is also available for information during The Forsworn Conspiracy. If Kleppr dies, Frabbi will take over all innkeeper services at the Silver-Blood Inn, including renting out beds and giving rumors. She was supposed to sleep from midnight to 8am, but a bug prevents her from doing so. She spends the rest of the day working in the inn. She can be found leaning on the wall, sweeping the floor, as well as warming herself near the hearth. Frabbi wears a set of barkeep clothes and shoes, and carries an iron dagger, some common items and gold, and the key to Margret's room. While in the Silver-Blood Inn, she will greet you with "Now you just tell me if you need something." and "You come right to me if you find an unwashed floor or lumpy bed." If Kleppr is alive, she will openly insult him by making comments such as "Unlike my husband Kleppr, I watch after our guests. ", "I'll bend Kleppr's ear if there's anything wrong with a room you rent." and "Isn't my son Hreinn such a good worker? Not like his father at all...." Even if Kleppr dies, she will continue to insult him, saying things like "My worthless husband is gone, so I run the inn now." and "I can't believe the mess Kleppr left things in. I have twice the work with him gone." When you part ways with her, she will say, "I should remind Kleppr to clean this place up." if Kleppr is alive, or "Bye, now." Likewise, her husband Kleppr also disparages her: "If I can't get you something, I'm sure my wife will bellow at me until I can." If you fail to intimidate him in The Forsworn Conspiracy, he will retort, "Are you serious? I hear more threatening words from my wife." If Frabbi dies, he will remark, "Things are so much quieter with my darling Frabbi dead." Their children are aware of this as well, as Hreinn will tell you, "My mother and father yell a lot. Always have." while Hroki will try to excuse them: "Don't mind the yelling. My parents are always going at each other." When asked about where you can learn more about magic, she will be dismissive: "Magic? Got no good use for that here. Mages keep to their College in Winterhold. Go bother them. Wish the Jarl's wizard would up and leave with ya." As innkeeper, she will offer you some rumors as well: "Degaine the beggar got himself kicked out the Temple of Dibella. Caused quite the ruckus." if you are in Markarth and have not accepted Degaine's offer, "They say that something happened in the Hall of the Dead. Brother Verulus has the whole place closed. ", or "A witchhunter from the Priesthood of Stendarr is in town. He's asking a lot of questions about that old abandoned house." "Did you need anything else?" Kleppr: "Frabbi, my dear loving wife, could you please clean out our guest rooms?" Frabbi: "Clean the rooms yourself Kleppr. It's not like you do anything important around here." Kleppr: "No, just check in the guests and manage the coin and keep a roof over your head. No, nothing important"
Frabbi: "Kleppr, you idiot! Can't you do anything right?" Kleppr: "What? What did I do this time? I was just standing here!" Frabbi: "You were just standing there when you were supposed to be serving drinks to our customers!" Kleppr: "Shouldn't you be helping me then, wife of mine? Sharing my problems? Being my better half?" Frabbi: "I am your better half. And your better half is telling you to stop being an idiot and serve the customers their drinks!" If both Kleppr and Frabbi die, Hreinn was supposed to take over as innkeeper. If Hreinn were to die, Hroki would take over as innkeeper. Surprisingly, if they all died, Rhiada will take over the Silver-Blood Inn, though she will remain in the Treasury House. According to her packages, Frabbi was meant to sleep from midnight to 8am in the inn, but she will not. [verification needed — Why doesn't the package activate?] ? This page was last modified on 12 August 2014, at 02:40.